In that simple story, it sums up the battle we each have. But it is not the only story that leaves a message on this topic of are we human or beast. Two stories stand out. Both told in film format by Disney. “Beauty and the Beast” and “The Hunchback of Notre Dame”. “Beauty and the Beast” (French: La Belle et la Bête) is a fairy tale written by French novelist Gabrielle-Suzanne Barbot de Villeneuve and published in 1740. Her lengthy version was abridged, rewritten, and published first by Jeane-Marie Leprince de Beaumont in 1756. The story was then turned into an animated movie by Disney in 1991 and then later into a live action version in 2017. The story has such messages as “Love is stronger than hate” and it’s not what is on the outside but what is on the inside that counts. The second story “The Hunchback of Notre Dame” is a novel by Victor Hugo which was adapted for screen and stage and been told in various films and on TV. The novel's original French title, “Notre-Dame de Paris” which is a double entendre: it refers to Notre Dame Cathedral, on which the story is centered, and Esmeralda, the novel's main character who is “our Lady of Paris” and the center of the human drama within the story. It explores the idea or what makes you a human and what makes you a monster. It also takes a look at what a hero really is. The late Christopher Reeves who played Superman said this “ I think a hero is an ordinary individual who finds the strength to persevere and endure in spite of overwhelming obstacles”. That quote sums up the story of “The Hunchback of Notre Dame”. Based on the Victor Hugo novel and songs from the Disney animated feature, “The Hunchback of Notre Dame” showcases the film’s Academy Award-nominated score, as well as new songs by Alan Menken and Steven Schwartz. Featuring the characters of the beautiful gypsy Esmeralda, Quasimodo the deformed “Bell Ringer” with a heart of gold, the handsome “Captain Phoebus, Frollo, and the evil Cardinal”... all brought to life in a magical production. 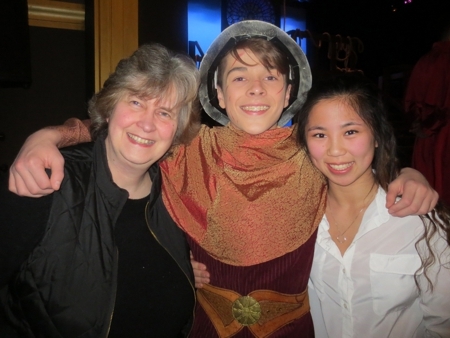 Through all the productions that have been done on stage in London Ontario, never has “The Hunchback of Notre Dame” ever seen the stage lights in the rich theatre town of London Ontario… that is until now. The very “big and difficult to mount and put on” production is being presented at the Palace Theatre in London by AK Arts Academy. The production’s Musical Director is the Creative Director of AK Arts Academy, Alexandra Kane. The show was produced by Jason McMannis and directed by Kaitlyn Rietdyk. The play is starring Colton Abel as Quasimodo, Diegra Kambamba as Esmeralda and Ben Kennes as Archdeacon Claude Frollo. "What makes a monster, and what makes a man? A story that can be described as ‘Hauntingly human’. This classic tale of life, love, and loss forces you to feel every emotion", says the play's producer Jason McMannis. This production even has connections back to iFilmGroup. The first is the lead actor Colton Abel. Who says iFilmGroup co-founder Matthew Marshall stage managed when Colton was in High School in St. Thomas at AVSS. The second and bigger connection is Zach Wilson who was part of the productions ensemble cast. He plays a few roles within the production, but the main one is the Guard for the cathedral. Wilson is a member of iFilmGroup and has been a part of three productions with the founders of the group. He was a student in Malicious Attack, Rob in Summer of Discovery and one of the basketball boys in Blue Love. Even with being a part of the ensemble cast Zach showcased his pure talent. He has continued to work on his stagecraft and improve his vocals as his voice has been maturing. Marshall says…“Its always a pleasure watching Zach on stage”. The iFilmGroup team has not ruled out Zach being a part of some future cast with iFilmGroup. “He has a bright future and is a star,” says iFilmGroup’s other co-founder Don Hickey. 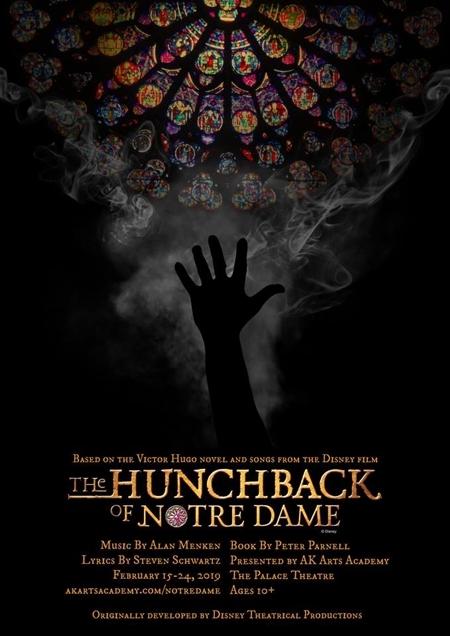 Hunchback of Notre Dame will run until Feb 24th. But there will be no rest for iFilmGroup member Zach Wilson as he will be jumping into the leading role at his high school for their production. More details to come later but the teaser is that he will be belting out notes with his wonderful voice again. The dust has settled from the 2019 Western (UWO) Smartphone film festival and we are a few weeks removed from the event. The cast and crew of the surprise winning film “Filtered” have had time to reflect on how they came away with the top prize at the festival. The winning film was made by a group of Sheridan College students under the title of EMG Productions. This film about two best friends walking home from a party only to be attacked by an unwanted follower at first look didn’t look like a top contender at the festival. A good film yes but the best of the festival? But like the theme of the festival sometimes perception and reality are two totally different things. The film’s Producer Scot Edward Morris sums it up best. “So after they showed the first film of 10 AND we were the last film mind you, I put my head in hands and whispered to myself, oh ______” Morris says. He could not believe people imaginations when it came to the theme of “Perception verse Reality”. But you see the EMG Productions team had planned their’s film different. Some would say they thought outside the box, others would say they took the rules of film making and walked all over them. The team had shot their film vertically and not traditional letterbox horizontal. ”As each film went by I knew we were going to be the only film that shot vertically” says Morris “By the end of the screenings, we were all intimated by the quality of each film that we figured we would just celebrate the experience of being at the festival itself” says the film’s director and co-writer Paula Ner Dormiendo. “We all agreed that no matter what the outcome may be, we were all so very proud that we even made it that far” adds Taylor Jeanette Gaudon who played the role of “Alanna” in the film as well as camera crew. The editor of the film also adds “When we heard who got third, we looked at each other with a “well, that would’ve been ours, and it's not, and that’s okay, we had fun” says Sam Batterbury who was the film’s editor. Then the announcement of the winner came “Filtered” by EMG Productions. The team all feels that “shocked” describes their immediate feeling perfectly. Matthew Marshall one of the judges of the festival and iFilmGroup co-founder and co-owner of m & s Marshall Productions gives some insight into “Filtered” winning. Marshall admits when he first saw the film he was not entirely in favour of it due to the film being presented in a vertical format verse tradition horizontal. “The film broke the traditional rules of film, and as a filmmaker, it bothered me at first, but then I started looking at it more closely. At its heart, the film embodied what the Western Smartphone Film Festival is all about. Because the films needed to be filmed on a smartphone this brilliant team thought outside the box and filmed their film in tradition smartphone format of perpendicular. The entire film is the viewer seeing the videos that are on the cell phone,” says Marshall. The “Filtered” team admits when they heard the announcement they are pretty sure the one word that went through everyone’s mind was “What? !” Their mouths dropped and some of them immediately grabbed each other as if to check if they were real. The shock was not because the team was not confident in their story but more so because they all really admired the other contestants’ work and saw the amount of effort and creativity that went into each one. But then the fact that they had won started to settle in and they were filled with so much excitement and could not stop smiling. After winning a film festival it is only natural to reflect on the process that got you to this moment. The process started with Scott Morris approaching Paula Ner Dormiendo about the festival and the project idea and asking her if she wanted to direct. Ner Dormiendo and her co-writer Robin Gruszczynski set to work coming up with a script. The inspiration for “Filtered” came mostly from one distinct idea that stood out during the brainstorming process. It began with a concept for a scene of a teenage girl filming herself, laughing and enjoying the company of her friends. As she continues to film, her smile suddenly fades and is replaced by a terrified expression when she witnesses something out of frame. The scene in Filtered where the main characters see a dark hooded figure off-screen for the first time was heavily inspired by this. They were drawn to the idea of building tension by having the audience blind to what the main characters were able to see. The team took advantage of the limitations of a “frame”. This became their central strategy and what drove the majority of the film’s development. Whereas, the theme of bullying came to the surface when they discussed the topic of social media and the dangers of having an online presence. With the concept of “What’s not in frame” and the topic of cyberbullying, the two subjects naturally intertwined in a way they knew they could connect to the festival’s theme: Perception vs Reality and the story was born. “Looking over the specific theme of “Perception versus Reality”, Paula and I searched for ideas to explain how certain things aren’t always what it seems. One discussion led to another, we came up with the concept as to how people on social media only display their highlights. How people in society are perceived as good to the public, yet are unaware of what is beyond the filtered life says Robin Gruszczynski, who not only co-wrote but also was the film’s sound designer. Starting any project is always a nerve-wracking process, but especially when the production only had a couple weeks of planning. Some of the team had worked together on previous projects. So at least part of the team understood how each other work and knew and could feel the drive and passion everyone had towards this production process. “Working on a team where everyone feels in sync is an amazing thing. It’s like watching a concert where the music harmonizes flawlessly, or when an athlete pulls off a perfect move in front of a crowd” says Batterbury. Every production process has its ups and downs, this film was no exception. The need to find locations where you are allowed to film in, equipment was very limited, with filming in low key, low light situations they didn’t want to stand out with big lights and audio equipment. The timing of shooting also became an issue. “Some of the challenges we faced was lighting, exposure, and actually filming the clips. Since iPhone has no control over aperture, we only had to work with shutter and ISO through a manual camera app. I always tried to film everything in low ISO. I used an external LED and a battery pack and rigged them together. Lighting was tough because I had to hold the light while the actors filmed everything. There were bits where Robin and I had to run behind the camera and still light the scenes” says Sumi Ragu who was the Cinematographer and in charge of lighting. Lighting was not the only area of struggle at points during the production, the role and the acting effected at least one of the ladies acting. “For me it was a very emotional experience. It was quite natural getting to act with two of my best friends Karin and Sabrina. However, I did have to take myself to a dark place to put myself in the shoes of a bully. Seeing the look on Sabrina’s face in the last scene broke my heart… take after take we had to do”, says Gaudon. Through it all Producer Scott Morris had to be the guy on set always checking his clock, always wondering who is where, when, can we finish the film, once we were done a scene immediately alright looking what’s next. Even after filming the process was not done. Editing “Filtered” was tricky because it pretty much had to be edited in reverse, which nobody is used to. Moreover, there were bountiful technical issues which slowed down the process at times. However, with enough patience (and google searches), it all worked out well in the end. Well enough to win the Western Smartphone Film Festival. Perhaps editor Sam Batterbury sums it up best “I believe that in the film it’s a miracle that anything gets made. Each project has its own magic to it, and it makes you appreciate the process a lot more. I hope that this is a big step in contributing to many more miracles” says Batterbury. Going through this process from start to finish has changed this team. They may all attend the same program at school but they have created a bond because they shared the process of this film together “It’s not a matter of winning, but what brought us to win. Creating a story that drives the people around you into showing their craft, is truly a win right there. And most importantly, the bond I’ve created with my team in making this short film is a true win for me” says Gruszczynski. Other team members added to that thought. “We each have the opportunity to say that we gave it a shot and put ourselves out there. We each are our own kind of “out of the box” individuals and we took a leap of faith to share that with the world and the outcome is very rewarding. Through this entire experience, it has been an absolute pleasure working together as a group and I believe that after this achievement we have every intention of working together on something new hopefully the near future” adds Gaudon. “We all attend the same program at the same school but, and I’m sure they’ll agree, that this experience definitely brought everyone closer together,” says Ner Dormiendo. With the film done and having won the festival, the team looks forward to more festivals with this film and the possibility of more projects together in the future. Some excited about receiving their first IMDb credit, knowing how difficult it can be to get up on the site. But with the achievement of getting that credit giving industry legitimacy. Having your name on IMDb is a door to open up avenues to future projects. Many of the team move forward from this point, learning where to improve and where they can put more of their passion as well. They come to see how important it is to appreciate each and everyone’s individual talent and to see the results form into one great film. They each look forward to continuing working with their fellow team members and to see what else they have in store in each of their creative imaginations. We leave the final words from the team to Scott as the producer of the project. “I’m proud, truly I am. This was my first time going through the whole process of development into distribution. I’m still in the process. I love it. The chance to see your team succeed and knowing you put them together is heartwarming. I’m slowly breaking into this industry and I’m fully aware that I have more to learn, but that’s the thrilling part of this industry… is that we’re constantly learning. Of course, I made little mistakes, I’m not afraid to admit it, but at least we're trying” says Morris. Try they did, and this team from Sheridan College struck gold with this little gem of a film and have proven that anything is possible if you just dare to dream and create. We are all only limited by the restrictions we put on ourselves. “As a filmmaker you can’t listen to that voice inside your head that says you will never achieve your hopes and dreams in making films, “ says Marshall who has been making films for thirty years. Article From “OUR LONDON” April 2017. Featuring Movie “Malicious Attack” made by m & s Marshall Productions.